You must consider your skin tone when you chose a blush. Purminerals Chateau cheek cream blush in Coy: This neutral tone works with any clothing color, but makes a particularly safe bet with bold colors and prints. 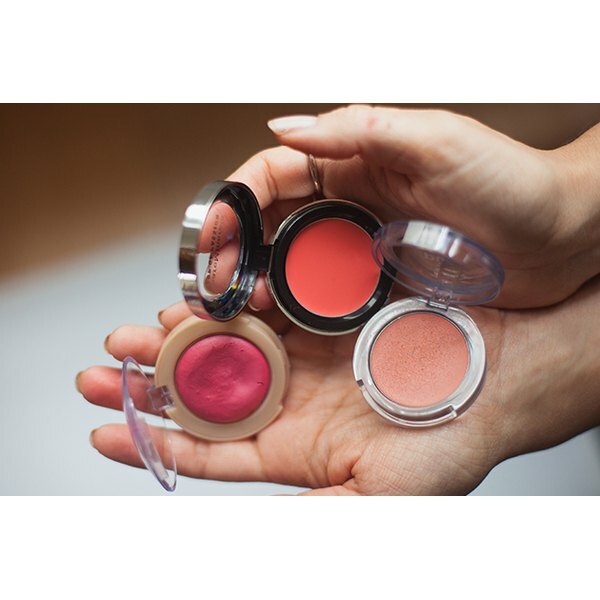 Bare Minerals Blush Balm in Papaya Passion or Posy Passion: Opting for pastels or neutral clothing? Liven up your face with a pink that suits your skin. Maybelline Master Glaze Blush Stick in Coral Sheen: If you are wearing white, chambray or even a floral pattern, corals are a really great way to keep the glow on your face without competing with your ensemble. Benefit Brightening Face Powder in Dandelion: Brightening powders work with just about every color since they are a subtle addition to your complexion. No matter what skin color and tone you have, a brightener should lift the shadows from your face and add a very subtle hue. Maybelline Dream Bouncy Mousse Blush in Pink Frosting or Peach Satin: The lighter pinks and peaches are perfect for complementing sorbet clothing colors, bold prints and even simple neutrals. These colors are an easy way to light up your face and add just enough color to achieve a sun-kissed look without too much fuss. *Mousse, stains and sticks can all be blended with your finger or a sponge. Brush small strokes starting at the apple of your cheeks. Blend the color towards your cheekbones. Layer it for a richer result. *Cream blush can also be applied with fingers or a sponge as well as a blending brush. *For powder blushes, use a nice and full blush brush to blend well with your base powders. No matter which finish you choose, it helps to use a finishing powder to blend your makeup and avoid splotches and streaks.